Simply heat, and glaze if desired. A perfect ham for holiday entertaining! 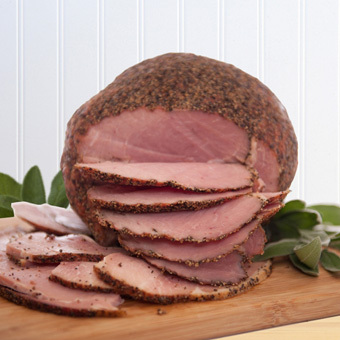 Our boneless pepper ham is as appropriate for a holiday buffet table as it is for a casual summer get together. 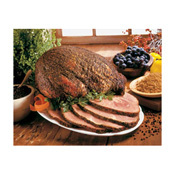 All meat, with virtually no waste, this easy-to-carve ham has been smoked over aromatic Ozark mountain hickory for a minimum of 18 hours, imparting a delicious, smoky flavor throughout the meat. If that's not enough to make your mouth water, the ham is then hand-rubbed with a succulent combination of cracked black pepper and brown sugar that gives just the right amount of zing to each bite. A favorite for business gifting, year-round! Your ham will ship frozen. Please expect some thawing to occur in transit. If you are serving your ham within a few days, we suggest you defrost under refrigeration (24-48 hours). Your ham will keep indefinitely in the freezer; however, we suggest you enjoy it within 6 months to guarantee its' superb flavor. Your ham is fully cured and smoked very slowly over hickory coals. While it will arrive ready to eat, we think warming enhances the flavor. Allow your ham to sit at room temperature for 1-2 hours before heating. Remove ham from plastic outer covering, and place on a rack in a roasting pan. Add 1/4" water to the bottom of the pan. Bake uncovered in a slow oven (300-325 degrees) for 10-12 minutes per pound. You may cover the pan loosely with aluminum foil for the last half hour of heating. Let rest, uncovered, for 20 minutes before covering. Complete heating instructions will be included with each delivery. Petit Jean Meats of Morrilton, Arkansas, family-owned and operated for over 80 years, is best known for producing some of the finest meats on the market today. Their famous pork products are truly remarkable. The company's beginnings date back to 1922 when Felix Schlosser, a butcher and German immigrant, relocated to Arkansas in search of a better life. He opened a small retail meat market in the town of Morrilton. Schlosser's nephews Ed and Lonnie were brought into the business at the ages of 12 and 10, respectively, and first delivered meat to homes in Morrilton by bicycle. "They would deliver meat to people in the area twice daily," says David Ruff, current CEO and President of Petit Jean Meats. He is also Ed's son. "They didn't have refrigeration back then, so my dad and Uncle Lonnie would often deliver sausage in the morning for breakfast and beef or pork in the afternoon for dinner." It is this commitment to serving quality meat products to a loyal customer base that has carried Petit Jean Meats for more than 80 years and through some of the most significant eras in American history. In the 1930s, the fledgling company survived the Great Depression by butchering cattle for the Emergency Relief Administration, when the U.S. Government purchased starving cattle from drought-stricken western states and shipped them to various slaughter houses by rail. The company, then dubbed Morrilton Packing, was contracted via a one-page government document to slaughter and refrigerate the cattle for the compensation of $1 per head plus the hide and offal of each. A canning facility was set up next to Morrilton Packing in downtown, which prepared the meat for distribution to needy families. Approximately 15,000 cattle were processed under the contract. Some 70 years later, Petit Jean Meats (named after Petit Jean Mountain, close to the facility) is a modern wholesale business operating in a 56,000-square-foot facility and producing approximately 6 million pounds of product annually. The company offers an assortment of products which are sold and shipped all across the country, and Ruff attributes the continued success to the unwavering practice of the company's philosophy. "Petit Jean Meats always has and always will offer products of distinct flavor and superior quality in trim, texture and content. We have a very loyal customer base." In an economy where sales of most "premium" products are down, Petit Jean Meats is still going strong. "If a family is used to having a Petit Jean ham for Christmas, they are still going to have it. In this respect, our products are seen as a necessity, not a luxury." Petit Jean Ham is also marketed under the Neiman Marcus label, and, since 1940, is the only ham served at The Pancake Shop, the legendary breakfast eatery in Hot Springs, Arkansas. To ensure freshness, we ship our hams on Mondays and Tuesdays for arrival Wednesday through Friday. Some states require express delivery due to time and distance from our shipping facility. You will be notified during the checkout process if your delivery address requires upgraded shipping service.